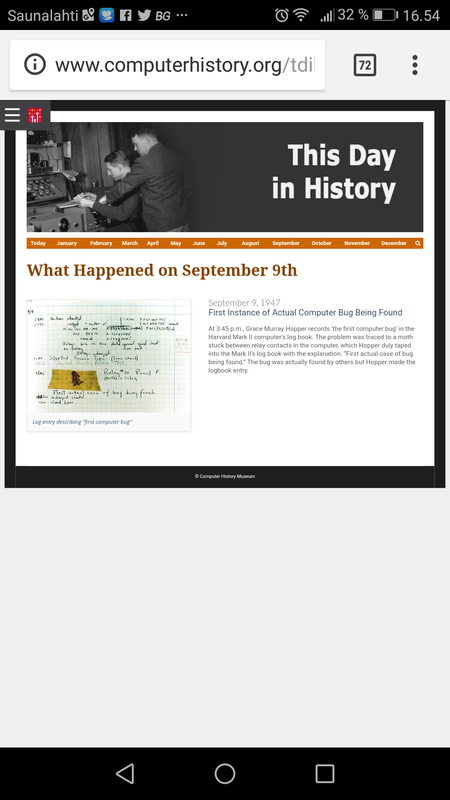 This describes the history of term “computer bug”. In September 9, 1947, a team of engineers working on the Mark II Aiken Relay Calculator at Harvard University had a problem: the bug was an actual large moth, about four inches in wing span, in one of the relays beaten to death. Debuggers put it in the log book and pasted Scotch tape over it. So this is documented computer bug on history books. The term “bug” had been used by engineers to describe flaws in machines as far back as Thomas Edison, but Grace Hopper popularized “bug” and “debug” as early computer-programmer language. Software bugs and debigging still haunt software developers over 70 years later.